It happened again just last week. I’ve heard a variation of this question several times. It reminds me there are some serious myths out there around introverts, including ones that imply building and demonstrating confidence is an extrovert’s game. Well, that couldn’t be farther from the truth. 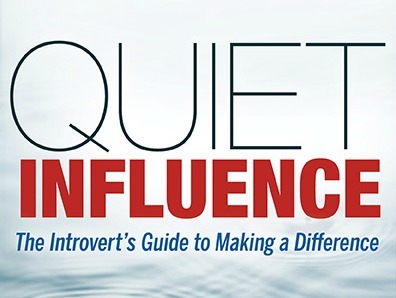 That’s why I’m glad the new book by my friend and colleague, introvert expert Jennifer Kahnweiler, is here: Quiet Influence: The Introvert’s Guide to Making a Difference. I caught up with her recently to talk about her recent research behind the strengths of introverts, as well as what extroverts need to realize about their introverted counterparts. Read on to listen to (or read the transcript of) our interview. Listen to our conversation below (22 min, 28 sec) or download the MP3 here. Darcy: Hi, it’s Darcy Eikenberg. I’m the founder of RedCapeRevolution.com where we help everyday leaders bring their superpowers to work. I’m so excited today to have on the line Jennifer Kahnweiler, who is the author of a new book called Quiet Influence, and Jennifer will tell us more about that book. From time-to-time, I love to be able to bring interviews with people that I think are doing great things – bringing their superpowers to work and sharing some amazing content and ideas that are beneficial for people here at RedCapeRevolution.com. So, thank you Jennifer, for being willing to spend some time with us today! Jennifer Kahnweiler: Oh, Darcy, it’s totally my pleasure. D: I’m so excited about the new book, Quiet Influence. I’ve watched Jennifer’s work for a while. I had talked to Jennifer earlier on her first book, The Introverted Leader – Building On Your Quiet Strength. It’s been fun for me to be able to see the evolution of this material. So, just a little bit about Jennifer before we get started. She’s a PhD, an author, a speaker, executive coach, and really has been hailed as the champion for introverts. Her last book that I just mentioned, The Introverted Leader,\has been translated into six languages, (including) Chinese, Spanish, and I know you’ve spoken in Singapore and all over the world! Introversion isn’t just a U.S. issue, it’s everywhere. She also does consulting with GE, AT&T, with Turner, the CDC, and I am honored to call her not only a colleague but a friend. I’m so excited about the new book! So welcome Jennifer, to the call. J: Thank you Darcy, and I feel likewise about you. You are a true colleague, so thank you for having me on the program today. D: I would like to get started just hearing a little bit from you about this term, “quiet influence.” It seems so contradictory. So, what do you mean by quiet influence? J: Well Darcy, I think people are really tired right now of the shouting matches that we see on TV. The time has come for a new wave of leadership, in my opinion. What I have found from my work since 2009 when my first book came out – actually, before then, when I started researching this topic – is that introverts can be really highly effective influencers when they stop trying to act like extroverts and really build on the strengths that they have inherently, so that’s really the thesis of the book. I coined the term “quiet influence” because they do it without shouting, and I wanted to learn more about what that looked like. D: I can picture in my mind people that I’ve known that have been that sort of “quiet influence,” pulling back while everyone else around them has been shouting, pointing, saying “Look at me!” I’ve never really thought about that as being an introvert’s leadership style and using it as an asset. But it’s really interesting to think about it that way. J: There’s so many of our leaders who are like that, but it’s also people in all walks of life as well. One of the things I talk about in the speeches that I give is about a woman who came up to me and said, “Do you know who my favorite quiet influencer was growing up? It was Mr. Rogers.” I hesitated for a minute, and I thought, “Absolutely!” His quiet voice, his calm countenance. Think about the influence and the impact he had on those impressionable young children who sat and watched him everyday after school. That quiet influence – being kind, and “Won’t you be my neighbor?” All those kinds of phrases! That was a wonderful example of a quiet influencer. D: It does really draw you in. J: Oh yes, absolutely. That’s what quiet influencers do. They have that ability, and many of our introverted listeners do that – they do it in a way where it’s not all about them. There’s really an interest in you, the engaged listening and finding out more about other people and not taking it from an ego’s standpoint, if you will. D: I know you’ve been working on this topic for many years, and I know you’ve helped me get over some of the preconceived notions that I may have had about what introversion is, or how different personality types can interact in the workplace. You spoke about this a little bit, but I’m curious for you as a researcher and expert on this topic – why teach on this now? Why is it important for us to pay attention to this topic now? J: The world is changing as we all know, and it’s very fast. It’s a virtual world, it’s a global world, we have flattened organizations. In order for us individually to be heard, for people to contribute their value to an organization as well as to have a workplace really benefit from your ideas, new thoughts, provocative thinking, and challenging the status quo. All of those things are so key right now. Introverts really are the right personality type to do that. That’s one of the arguments that I make in the book, and try to make the case that we really need to listen to the introverts. D: Even during the time that things are moving so fast, it feels like we just need to move faster, yell louder, or get more attention – you’re actually saying that we need to be turning more inward, or listening to what’s not being said? J: I think it’s important to tap into that side of ourselves that is more introverted. I come at this from the old Myers-Briggs — a good standby that a lot of listeners have probably been familiar with– and before that, Carl Jung was the psychologist who developed this whole typology of introversion, extroversion, and several others. With introversion, we all have that side of ourselves. In fact, as I wrote this book, I really tapped into the introverted side of myself. Even though most people know that I’m more on the extroverted scale, I really relish my quiet time and I value that. I know that’s something that makes me more grounded, it keeps me calmer, it helps me be more creative, and if I ignore that side of myself then I’m missing out on the whole contribution that I can make as a person to my field, my family, and all those different areas. I think that’s really key. 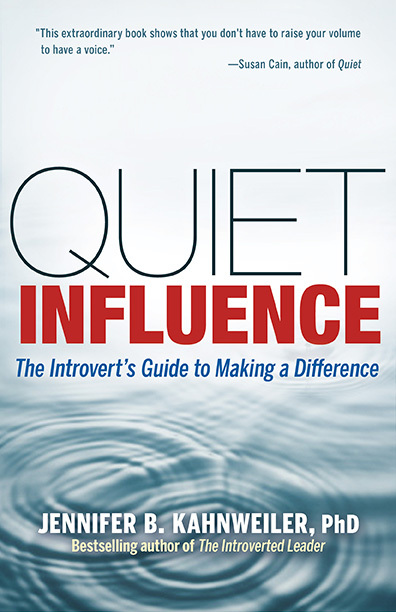 If you talk about balance, it’s for introverts in this book in Quiet Influence to realize that they have it already, and how they leverage those quiet influence strengths. But also for people who are not, to have a similar experience that I did – to really appreciate that side of ourselves within us. D: That’s interesting, because that happens to me too, sometimes. I think of myself as being great out in public and with a group, and yet some of my best work and when I’m feeling most productive are really when I’m in a much more quiet environment. I miss that when I don’t make time for that. It’s a learning curve to make space for that side of myself, instead of doing what’s going on in the world today – that I have to keep moving faster, louder, bigger, to keep up with everything else. It’s a great awareness. Need more clarity in your career? Click here to find out more about my mini-course. You mentioned the strength for introverts – I know you’ve talked about it in the past, the stereotypes about introverts, and sometimes I talk to introverts who think of that as a negative as opposed to just being a personality type. What are the strengths that this particular personality type tends to have that you found in your research? J: I boiled it down based on interviews I did with over 50 introverts. It’s certainly out there in the world, absorbing, observing, and reading – what I came up with six strengths. The first thing that introverts do is that they take quiet time, they crave solitude, and it really gives them a chance to be creative and to have more self awareness so that they can then go out into the world and make their difference. The second thing they do is that they carefully prepare things. They prepare so that they’re confident, and we talked about that on our last interview. The third thing is that they listen and they’re attentive — I call it engaged listening, where they establish a rapport with people, and introverts are known to be incredible listeners. A lot of them tell me “I’m the person in the office that everyone comes to talk to.” They find it therapeutic, if you will, that “they like to bounce their ideas off me.” But it helps them also to really ask questions and serve as that sounding board. The fourth area is focused conversation. That’s really an important piece of that, after they’ve listened and prepared and taken that quiet time, it’s then about influencing others by taking their ideas and putting them forth in these purposeful conversations where you have one-on-one interactions. You really get to go deeper, rather than on a surface way. That not only provides encouragement to others, but it helps them to work through the inevitable conflicts that come in an organization, and it’s really the antithesis of email. That’s often times how work gets done, through relationships, wouldn’t you agree? D: Oh, absolutely. There was a blog post on the Harvard Business Review the day before about how email can be so unproductive. What I hear you saying is that using the introvert’s strength to have that focused conversation, communication, and even collaboration to be able to work through conflicts and get things done. It can be much more effective. J: Absolutely. It’s small groups and individual one-on-one conversations – in fact, there are some organizations that have catered to that. Places like Google allow people to have these pods and gather together in small intimate conversations. We talked about taking quiet time and preparing and being attentive in focused conversation. Now for the last two strengths. One is writing. Introverts tend to really express their thoughts and quiet influencers do so through these well-developed arguments that they make, and plans on paper, they get focused and clear about things and then they can put that out to people to get them on board and to understand what their concerns are. We’re talking about making a difference. The name of the book is Quiet Influence, and it really focuses on how you challenge the status quo, how to provoke new thoughts, how to inspire others – that’s a tool. Writing is a tool and taking the time to really carefully think through your ideas make you more focused and effective whether you’re making a stand up presentation to 200 people or one on one to your boss. The final strength is purposeful use of social media. It’s a long tongue twister, I couldn’t get it to be as short as the others. But I try to look at the successful introverts that I’ve known, the quiet influencers – people like a local engineer named Selah Abrams who I profile in the book who has been incredible in developing these “side hustles” from his main job. That’s something where he has used social media as a means to engage young people to come out and join this political organization, rising political leaders in the city of Atlanta. He’s a very quiet, humble, young man and he has done that all through use of LinkedIn and Twitter, he really engaged and amassed a group of interested community people. That’s really a great example of how you can use social media to impart your message. The introverts that I know who are successful quiet influencers do that. Many folks do have some concerns of privacy, but I look at those examples of those impactful people who are wise in how they use their time, and often times they are the more introverted folks that I’ve come across. D: It’s interesting that you think of one of the fears people had about social media is that it would detach people. But from an introverts point of view, it can really help to facilitate and connect in ways that are more in line with how they like to connect with other people. J: Absolutely. As we’ve seen over the last few years, if you start with the Arab Spring in Egypt, that was all started with social media and one-on-one influences and changes where people connect online. It’s definitely a revolution, and I think we should get over the fear of lack of privacy and not wanting to engage in a superficial way. I’ve seen introverts pick their platform and go with it, and they’ll be very focused on how they use that tool. D: Exactly what you said about being focused and all the other strengths add up together very well to have a powerful platform whether you’re a leader in an organization trying to advocate a point of view, or whether you’re trying to get to a promotion or new opportunity. J: Totally. I have a diagram that you probably saw in the book with six different ripples. Although their strengths can be sequential, you can dive in and have a focused conversation, and then write about it. It doesn’t necessarily have to be linear, but I have something called the QIQ – the Quiet Influence Quotient that assesses how you’re doing on those strengths and how effective you are at using them in your organization or small business or independent consulting. Then I give you a scale when you take the assessment which is in the book, and we’re also going to be launching that online April 20th. That way you can go back to it numerous times and see how you’re doing. Ask yourself where you think you might need to ramp it up with your influence – who do you have to get on board? Where do you want to make a difference? Then assess your progress along the way. That’s a good way to put it together. D: So someone can use the information in your book to go out, take that assessment, and be able to go back and try some different behaviors and recalculate their score, if you will? J: Exactly. And they can compare what they had done before to where they were headed. The whole idea is to continually improve your score and your scale. D: That’s great. When you have that on your site, we’ll have a link to it. I know you also have a quiz on your site, is that connected? J: It’s actually something I call, “QIQ Light.” It’s a survey that has been very popular since I launched it. It takes only a few minutes to fill out. If you go to JenniferKahnweiler.com. The challenge is spelling Kahnweiler, right? D: We’ll have a link with this recording so that people can find it. J: You’re so good about that! D: If you search, “Quiet Influence; Jennifer” you’ll get the spelling of Kahnweiler. J: Oh, good — I’m glad to hear it’s coming up there. I’m very excited, we launched a new website recently and everything is in one place, and the blog is there. I hope people will join our community, there are stories you can submit of quiet influencers and it’s a very engaging site. The survey quiz is on the top bar there when you go to my site, JenniferKahnweiler.com. You’ll see the quiz you can take to determine whether you’re a quiet or an expressive influencer. That’s a good jumping off point for them getting into the book. D: For those of us who may lean on the expressive side, what is the one takeaway that you would have for extroverts about what they should really be aware of and know about introverts? J: That’s a great question. It’s hard to say only one thing, I’ll try to squeeze in two. One is to allow introverts the time they need to think things through. And with how much they value quiet time, know that when they’re going into their cube or area and getting away from you, it’s not personal; they need their space. If you ask them a question and it really demands some thinking, then allow the introvert the time to process it. I think that’s really critical, and the main point. Related to that, giving quiet introverts the time they need to prepare, and to give them a heads-up. We mentioned preparation is a real strength, so let them tap into that strength. So before a meeting, tell them that you’d like them to participate and add what they’ve been working on, and give some bullet points on that. You’ll find that it makes all the difference, if you give them that heads-up. They can be more effective and their comments are more valuable. D: That’s great reinforcement as to why a book like this is relevant not only for people who might self-identify as introverts, but also people who have more extroverted tendencies and to help them be better leaders, and to understand how to work with people with different styles. J: Yes, exactly. I think it’s for everybody. I hope everybody will buy it–my publisher will be very happy, as will I! D: Tell us where we can find it. J: Everywhere, basically. You can find it on Amazon, Barnes & Noble, Goodreads, you name it. You can get the Kindle version or the online version that’s also paperback. It’s coming out in audio in a little bit. There’s no excuse not to find it, let’s put it that way! Also, there is a free chapter you can download, and I believe you’re going to be providing that to your listeners, Darcy? D: Yes, we’ll have that on the blog post link to this and give everyone a chance to read it, and also the links to Amazon and other places where it’s for sale. It’s a great topic. We talked about creating a revolution, and that’s really what we’re trying to do here, making sure that everybody can bring their superpowers to work– both introverted and extroverted. We can understand what’s unique and great about them. I think it’s an important topic for anyone who is really trying to make a difference in the workplace. J: Darcy, let me add that I love the work that you’re doing, as far as your revolution and being authentic and speaking your truth at work! I would say that both our revolutions are related. The rise of the introverts leveraging your quiet influence, and with the Red Cape Revolution, there’s no reason we can’t come together on this! D: It’s all about creating change at work for the better. That’s why I’ve loved the work that you’ve done. J: Likewise! It’s a mutual admiration. Thank you so much for having me. You can find more about Jennifer at JenniferKahnweiler.com. 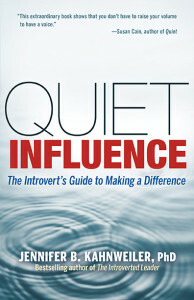 The book is Quiet Influence: The Introvert’s Guide to Making a Difference. Thanks again for being with us today. This is Darcy Eikenberg, and we’re signing off! YOUR TURN: Are you an introvert? How are you using your quiet influence? What else would you like to learn more about to help you bring those introverted superpowers to work? Tell us below or on Facebook or Twitter. Like what you read? Click here to get fresh career & success updates in your inbox. the guest list and Rsvp responses.